Market of Choice of Eugene, Ore., is recalling approximately 1,094 pounds of pork and poultry pâté. 5-oz. packages containing slices of “Market of Choice Country Pâté” and sell by dates prior to and including 04/25/19. 5-oz. 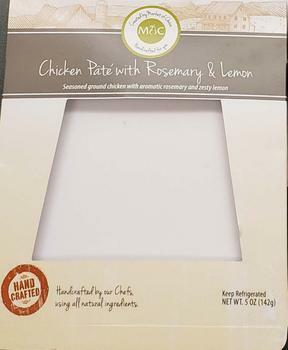 packages containing slices of “Market of Choice Chicken Pâté with Rosemary & Lemon” with sell by dates prior to and including 04/25/19. Whole terrine bulk packages containing “Market of Choice NORTHWEST GAME PATE” with sell by dates prior to and including 04/25/19. Terrine bulk packages containing “COUNTRY PORK & PISTACHIO PATE MARKET OF CHOICE” with sell by dates prior to and including 04/25/19. Terrine bulk packages containing “LEMON CHICKEN & ROSEMARY PATE MARKET OF CHOICE” with sell by dates prior to and including 04/25/19. The recalled products were shipped to Market of Choice retail locations in Oregon. Customers who purchased the recalled products should not consume them, but discard or return them to the place of purchase. Consumers with questions about the recall may contact Patrick Lowen at (541) 513-0486.